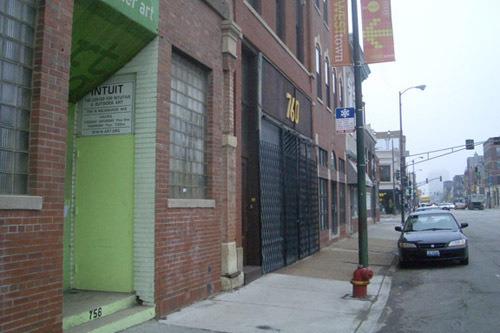 Intuit is sparsely staffed, yet they manage to plug into the community in a number of ways, including a program that connects with students in half a dozen Chicago Public Schools, a teacher fellowship program, and a collaboration with Gallery 37 that culminates in a show of student art once a year. Their gift shop sells handmade items made by local artists. Among the items that caught my eye were two painted Mrs. Butterworth's bottles, jewelry made from bike tubes and handmade wooden hair pins and spoons. Every year they lead a tour of outsider art in Europe, and their space is free and open to the public six days a week. The principle difference between mainstream and outsider art is that outsider artists are self-taught, and in many cases they tend not to part with their work. "Usually the only reason traditional artists sell their art is because its connected to the marketplace," said Kevin Mulcahy, Membership Coordinator at Intuit, "since outsider artists aren't selling their work, its more personal. They're not getting influenced by peers or influencing others, and they usually don't contact other artists." The idea of art as something that can be self-taught is very accessible and appealing, especially for the school children who participate in field trips to the gallery and create their own interpretations of what they see there. The genre includes a wide spectrum of individuals who range from virtual shut-ins, such as Henry Darger, whose Vivan Girls were the inspiration for the band of the same name, to Gregory Warmack, better known as Mr. Imagination or Mr. 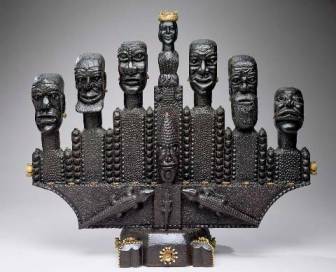 I, a Chicago-born artist whose works can be seen in various locations across the city, including the House of Blues and the Chicago Children's Museum, and whose sand sculptures were at one point a ubiquitous feature in storefronts along Belmont Avenue. The Henry Darger room display includes a scrap of paper that was found among his papers after his death, now framed and on display at Intuit, and reads: "All the gold in the gold mines, all the silver in the world, nay all the world its[elf] cannot buy these pictures from me. Revenge! Terrible veng[eance] on those who steal or who destroy them." Although the tone is very different, the essential message is the same as the quotation from Ulysses Davis that is the basis for the name of the current exhibit: "These things are very dear to me. They're part of me... I've been poor all my life. If I sold these, though, I'd be really poor. With these here, I feel like I have a treasure." It makes you wonder what makes an art object precious. Does it become valuable once someone is willing to pay a sum for it? My husband recently purchased some drawings from a man selling art from a grocery cart on the corner of Broadway and Ainslie who goes by the name of Mr. Soul Man, Leo E. Williams. We had parked right next to his art, which was displayed on the sidewalk and held down with broken pieces of red brick. We had an errand to run, and when we returned he was sitting on the ground, leaning against his grocery cart, eyes closed. "Hey man," my husband said, "I'd like to buy some of your drawings." Mr. Soul Man got to his feet and began opening garbage bags filled with pencil and ink drawings rendered on construction paper and cardboard, most of them representing pop artists like Chaka Kahn and Lou Rawls. He kept us in his thrall for twenty minutes before we completed the transaction, which culminated in an exchange of $10 for four original pieces of art. Patrick Blackburn, the president of the board of Intuit, describes the organization's mission as "making the public aware of outsider art and its value, who the artists are, and what it means. Outsider art is more from the heart, not that trained artists aren't creating from the heart, but most outsiders are generally creating for another reason; for the joy of it, for sharing their emotions, for sharing their life -- that's what draws people in." In addition to the current exhibit, Intuit will be running a number of special programs in the coming months, including a field trip to Russel Neswick's concrete coral reef in Lake Village, Indiana; a panel discussion on the drawings of Charles Steffen; and a lecture on Henry Darger. Most events are free, for more information call 312-243-9088 or visit Intuit.